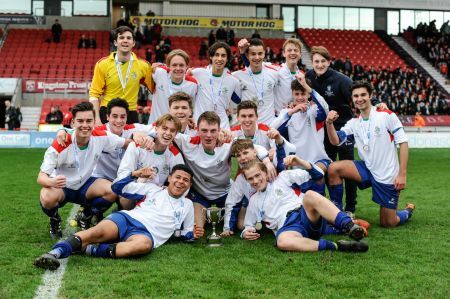 The ESFA will be staging the Boys’ U18 Schools’ & B Team National Finals at Doncaster Rovers FC on Monday 12 March! Over 400 Schools from across England entered the English Schools’ FA (ESFA) U18 Schools’ Cup and ‘B Team’ Cup for Boys this season and on Monday 12 March the four remaining National Finalists will battle it out to become National Champions at Doncaster Rovers’ fantastic Keepmoat Stadium. The four finalists, who ahead of March’s finals will have progressed through eight previous rounds of the U18 Schools’ Cup competition or five rounds of the B Team Competition, will partake in this last fixture to decide which teams will become victorious in 2018. The U18 Schools’ Cup competition will reach the quarter-final stage once the draw is made on Monday 22 January with the eight remaining teams then only two matches away from staking a place in the Final. The U18 Schools’ Cup for B Team competition is already at the quarter final stage and the semi-final draw will be made next Monday 15 January. 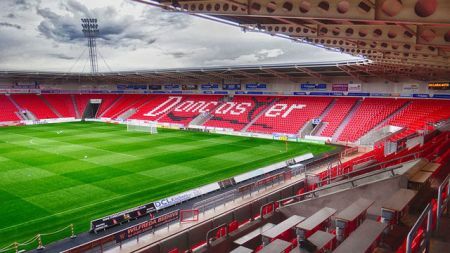 Doncaster Rovers FC have been kind enough to stage an ESFA National Final for the fourth consecutive year at the Keepmoat Stadium and the ESFA will be looking to welcome spectators along to cheer on the finalists for their last 90 minutes of the 2017-18 season, in what is sure to be a show of elite footballing skill. Both matches will take place on the same day with kick offs of 12pm and 4pm, which means a whole day of showcasing the talent of Schools’ Football. Full details will be released once the two Finalists are in place. Entry will be charged on arrival at the Keepmoat at a rate of £4/adult and free of charge for all students under 18. Hospitality packages for the event will also be made available to purchase and these will be announced via the ESFA Twitter account in due course. The ESFA would like to thank Doncaster Rovers once again for hosting another National Final double header and are looking forward to announcing the four teams that will get the opportunity to play at the fantastic Keepmoat Stadium in 2018.